Some years ago George and I came across a movie called "The Biscuit Eater". Originally a short story, it was made into a movie in 1940, and remade by Disney in 1972. The 1940 version was so full of stereotypes it made us cringe, but the curious title stayed with me. Despite the definitions currently available for "biscuit eater" when doing an Internet search, in the movie the term was reserved for a dog that ate and took up space in the kennel but didn't perform the work it was bred for, which in this case was competing in field trials. A quick review of the short story reveals "A biscuit eater wouldn't hunt anything except his biscuits and wasn't worth the salt in his feed." I confess upon occasion I have teasingly referred to Lark as a biscuit eater because when compared with her over achieving mother, Lark has seemed rather lackadaisical about retrieving in general. It look me a long time to realize that Lark has both talent and drive for fieldwork, she was just waiting for me to put the work in, which I finally started to do last fall. Then she whelped her second litter on April 2nd of this year so we only had two weeks to train for the WC at the BYC after her litter left. This was not quite enough time for us to prepare and she went out on the first mark. However, we trained hard this summer and I'm pleased to report that Lark qualified in the WC on Oct. 6th at our National Specialty in Syracuse, NY. Lark's work in the WC was very nice. She marked all of her birds very well, and picked them up without a fuss, returning directly to me. I was especially impressed with her work on the second land mark, as I saw a lot of dogs appear to run right over it and hunt far and wide of the fall. 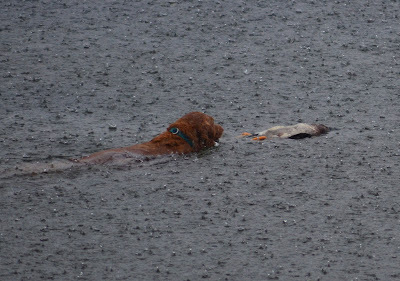 During Lark's second mark on water it was raining so hard I could hardly see her but she came through. Lark's WC completes her requirements for the Rusty Jones award. She joins her mother June and littermate Eta in earning this award. Lark has informed me I may never refer to her as a biscuit eater again, but that should not be confused with a lack of desire on her part to eat biscuits. First off I must confess to "borrowing" the gist of the title for this post from Laura Waudby's blog, "The Dogs Are Really in Charge". She's a dog trainer in MN who currently has a Corgi and a Toller and is training a Labrador Retriever to be a service dog. 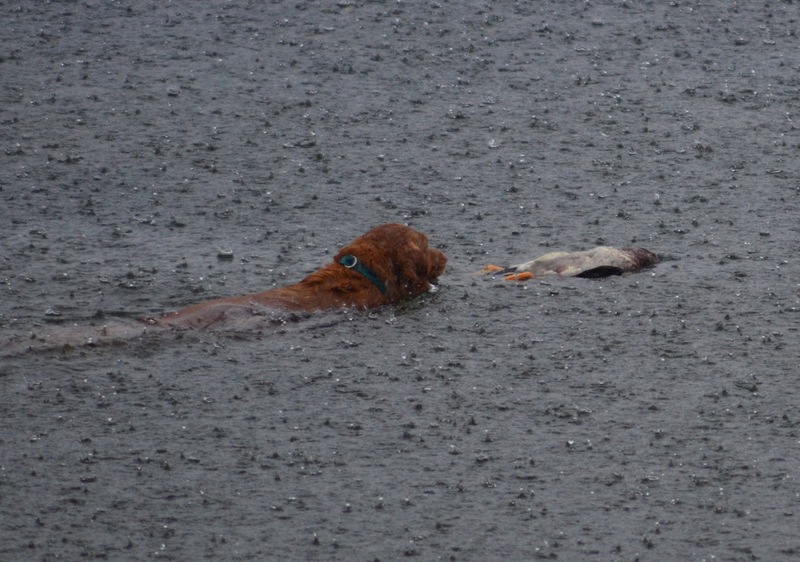 She writes about many different dog related training and trialing experiences and has a lot of interesting observations to share. I've recently come to the conclusion that June and Lark are in cahoots and working together to maintain the current status quo. They don't want to see another addition to the pack any time soon. I had my suspicions when Lark's second litter consisted of all male puppies, just like her first litter. Due to our small setup, so far I've resisted adding an intact male (especially one so closely related) to our pack. And then earlier this month Lark came in season, not an unexpected event, but 2-5 months earlier than anticipated, causing me to put any breeding plans for her on hold due to a project at work that would likely conflict with her due date. So for now the girls continue to enjoy lots of individual time and attention. 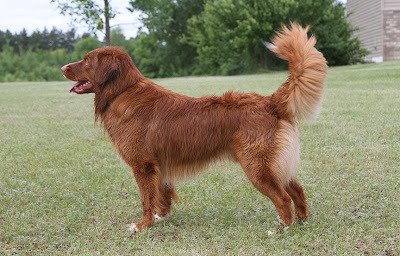 I can only hope they throw me a bone or two at the Specialty this week to make up for the severe puppy-itis I'm sure I'll experience in the presence of so many adorable Toller puppies. Amanda sent me this photo earlier in the week and I asked if I could post it here. 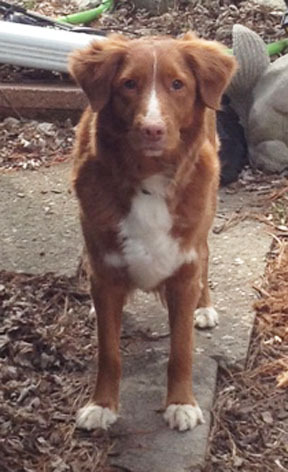 Apparently, Tobago did this while "waiting" his turn when Amanda was outside doing some field training with her other Toller Trini. It is an excellent illustration of what I mean when I say Tollers sometimes lack impulse control, though we love them anyway. Since we believe we'll soon be welcoming our newest litter, lately I’ve been spending a lot of time talking about the things we can do to positively impact the health of our Tollers. I recently came across an article which does a great job of summing up many of the things I’ve been saying for years: http://www.huffingtonpost.com/ted-kerasote/in-search-of-a-longerlive_b_2819334.html. Much of this is included in the information we send home with our puppy people, but I thought it worth reviewing here as well. What you feed your Toller has a direct impact on his health. We feed our Tollers a raw diet and advocate the same for our puppy people, but will recommend quality dry food options for those uninterested or unwilling to make this change. Rather than reiterate points other authors have already made, please review the following link for a relatively balanced review of raw diet pros and cons: http://pets.webmd.com/dogs/guide/raw-dog-food-dietary-concerns-benefits-and-risks. Here’s another good article on the benefits of raw feeding: http://healthypets.mercola.com/sites/healthypets/archive/2013/03/11/pet-holistic-medicine.aspx?e_cid=20130311_PetsNL_art_1&utm_source=petnl&utm_medium=email&utm_content=art1&utm_campaign=20130311. If you want to commit to a raw diet but don’t have time to do it all from scratch, there are many options available. Our dogs are mostly fed Bravo and have been for some years: http://www.bravorawdiet.com/index.html. Please note not all of Bravo’s offerings are balanced; some should be considered building blocks you will need to balance with additions. Another raw diet option we have used with success is Steve’s Real Food: http://stevesrealfood.com. This is a great list which discusses raw and cooked canine diets: http://pets.groups.yahoo.com/group/K9Kitchen/. Or you can hire the list owner to formulate one for you: http://www.monicasegal.com/. She also sells books which teach you how to balance diets on your own. We generally come off as “unconventional” (a nice word for oddball) on this front compared to what most people are used to hearing when they talk to other breeders or vets who often encourage spay/neuter between 6-12 months. Some breeders may even require it contractually though we do not, even if you never intend to show or breed and are just looking for a pet. 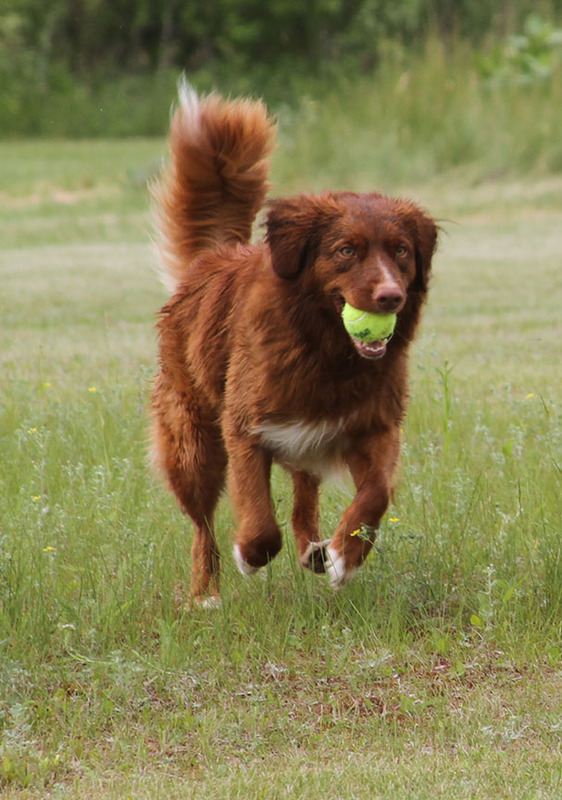 Studies done in recent years show that hormones play an important role in health, and spaying or neutering your Toller (or any dog) at an early age can have a negative impact. In recent years we’ve been encouraging our puppy people to wait a minimum of 15-18 months before taking this step, and would prefer you wait until they are at least two years old. We figure if we’re going to trust you with one of our puppies in the first place, we also trust you to be a careful steward of their reproductive system. Want more information? Read on! 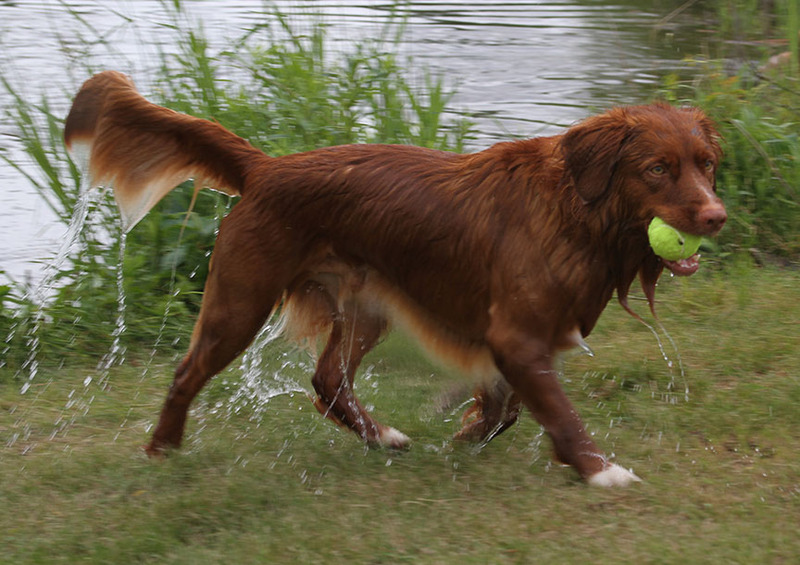 We believe in minimal vaccinations for Tollers. This is a breed noted for a higher than average frequency of auto immune diseases, and vaccinations are one thing we believe can trigger an auto immune reaction. We vaccinate our puppies with a parvo/distemper/corona combo as close to 9 weeks as possible. We recommend you do not vaccinate again until your puppy is 13 weeks old. Approximately four weeks after the second set of vaccinations (so around 16-17 weeks) we recommend you run parvo and distemper titers on your puppy vs. getting a third set of shots. Somewhere between four and six months you will be required to have your puppy vaccinated for rabies. We recommend the rabies vaccination be administered during a separate visit from the other puppy shots. This picture is from January but I haven't had much time to blog in the past few months. Lark is also lounging on the bed but notably NOT underneath any of the flannel bedding. One of them is also responsible for the flipped back covers and rumpled comforter. That will teach us to keep the bedroom door closed. Okay, it probably won't. 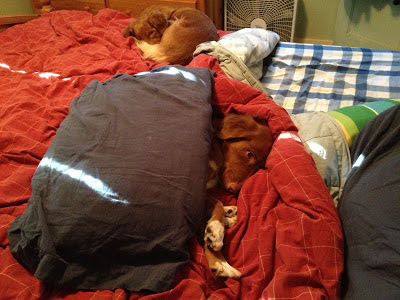 Someday I'd like to see exactly how June goes from freshly made bed to being ensconced in flannel. This post requires a bit of explanation. It's actually an adaptation from a page on one of my web site's previous incarnations in 2006. Wasn't June a cute puppy? The victim, one Chester chipmunk. Found in the state pictured 10 minutes after minor surgery to repair a torn ear and head abrasion. The perpetrator, one June, AKA Zephyr's Day in June. Approach with caution. Do not be fooled by her wagging tail. She will take your toys, food or anything else that catches her fancy. And if you happened to be a small stuffed animal she will shake you mercilessly and rip the stuffing out of you. Approach with caution. She can sometimes be distracted by throwing a toy or treat.